As a very regular visitor to Disneyland over the last 12 years or so, I have seen a lot of major events at the park and have been there for a few customer-relations stumbles as well. In one case in particular, namely the poorly run ticket-distribution for the 1998 Candlelight Processional show, one of Disneyland’s less shining moments ended up being one of my personally most important and memorable experiences at the park. The Candlelight Processional is a long running holiday tradition at Disneyland. It is a concert program that they typically run around the first week of December, which is a musical celebration of the religious aspect of the Christmas holiday, featuring a professional orchestra and a large massed choir formed from numerous church and school choirs as well as some Disney employees. The show also features a celebrity narrator, who tells the Biblical Christmas story in between the songs. This show has been a favorite Christmas season tradition for me for as long as I have lived out here in Southern California. It is something I really look forward to every year. Traditionally, this concert is performed on a stage set up in the Town Square area of Main Street, with the Railroad Station used as the backdrop. In most years, there are just 4 evening performances of the show, two each on Saturday and Sunday. The majority of the Town Square area is blocked off for the stage as well as for a large seating area. Tickets for viewing the show in the seating area are mainly distributed to Disney’s corporate partners and other VIPs while regular park guests start staking out seats early to the sides and further back in order to get even an obstructed view of the show. This can result in a lot of logistics problems and major bottlenecks in that part of the park on those days. Because of this, Disney a fairly short-lived (5 years) experiment starting in 1998 of moving the show to the Fantasyland Theater, an outdoor performance venue located across from "It’s a Small World". Walt Disney World had moved their version of the show from Town Square in the Magic Kingdom to a similar theater in Epcot a few years earlier and had eventually managed to expand it multiple shows a night throughout the holiday season, with reserved seating tickets being sold through popular dining packages. There was a lot of speculation that this experiment with a change of venue at Disneyland was also hoped to eventually lead to a similar expansion of the program, although that never materialized and the show was finally moved back to Main Street starting in 2003. We have had an exceptionally busy month of visiting relatives and our son’s birthday celebration and, to top it off, we have a trip to Florida coming up next week. With all that going on, we decided that we just didn’t feel like going through all the work of preparing a big Thanksgiving dinner at home this year. Knowing from past experience that, on Thanksgiving, Disneyland isn’t overly busy and they offer special menus of traditional turkey dinners at most of their restaurants, we decided that a day at the park was an ideal way for us to spend the holiday. We left for the park around 11am and I was pretty surprised at how heavy the traffic on the south 5 freeway was. In the past, I’ve usually found that traffic is pretty light on Thanksgiving, but the drive this time turned out to be pretty slow-going. We didn’t see indications of any accidents or other problems, so I suspect that our timing was such that there were just a lot of people heading down to Orange County or San Diego for holiday gatherings. The drive wasn’t particularly unpleasant, though, and we enjoyed listening to the Christmas music station on XM satellite radio during the drive. Thanksgiving is the first day that I’m generally willing to start listening to Christmas music, even though it seems like some stations start playing it earlier every year. We occasionally switched over to the traffic reports on XM, but didn’t get any information from that either. We found it weird when they were reporting one major incident on “southbound I-10”, considering that the 10 is an east-west freeway. Eventually, we figured out that the traffic reporter was misreading the first digit of “110” as an “I”. We often find the traffic reports on there a bit amusing since the reporters are clearly not in Southern California and often seriously butcher pronunciations. It is particularly fun listening to some of them trying to pronounce “Cahuenga” or “Sepulveda”. By the time we actually got into the park, it was close to 1pm. During a previous Thanksgiving visit, we had eaten at Carnation Restaurant on Main Street and had found that to be an especially good choice. It is a table-service restaurant, which is preferable to cafeteria style for Thanksgiving dinner, and the Americana setting of Main Street just seems exceptionally suited to the holiday. We were briefly concerned that the weather was a bit drizzly and overcast and the restaurant has all outdoor seating, but the weather was already clearing by the time we got there and we noted that they had large umbrella coverings over all the tables, so we decided to go ahead with it. Even though we didn’t have reservations, we were seated with only about a 15 minute or so wait. When they brought the menus and explained to us about the special Thanksgiving dinner, we immediately ran into a very large irritation, although it was one that wasn’t entirely unexpected based on a previous experience. Despite the fact that it was Thanksgiving and the fact that Disneyland is obviously well-known for attracting families with small children, they were not offering a children’s portion of the turkey dinner. Basically, children had to either order the adult portion (at the full price) or settle for a choice of chicken strips, macaroni & cheese, or PB&J. Our 5-year-old most certainly was not going to willingly accept anything other than a turkey dinner, which is one of his favorite meals even when it isn’t Thanksgiving. When this came up 2-years ago (and our son was only 3), we ended up escalating the issue to a manager and eventually the chef actually came out and offered to prepare a half-portion for our son. He also instructed the servers to make that option available to any other families and we saw several other families order the same while we were at the restaurant. I had hoped that after that experience they would start simply placing it on the menu, but I guess that didn’t happen. Our son’s appetite has grown quite a bit and, quite honestly, we just weren’t in the mood to go through the big hassle of escalating the issue again this year. Therefore, we just went ahead and ordered 3 adult meals. We figured my wife and I can also augment our own meals a bit, if it proved to be too much food. The portions were really quite large, though, and he did end up leaving some of the turkey (and most of the stuffing) on the plate, even after we did both take some of his food as our own second helpings. We did see other children in the restaurant also struggling through the large portions and I suspect they ended up with a bunch of waste. In retrospect, I do kind of wish that we had made more of an issue out of it again. The food was generally pretty good, although we did agree on one complaint. The gravy used on the potatoes and turkey was quite a bit more salty than it should have been. It certainly didn’t help that it didn’t occur to me to test it before adding a little additional salt. It still wasn’t bad enough to warrant sending the food back, but I did find myself scraping off much of the gravy. Other than that, the turkey was served hot and wasn’t overly dry and the potatoes and stuffing were good as well. The meal also came with some cooked vegetables which aren’t to my taste (I really don’t like any cooked veggies other than corn) and some fresh cranberry sauce and a dinner roll. With the obvious caveats above, it was a pretty decent Thanksgiving meal for about $15/person and the location certainly was top-notch for it. While pumpkin pie was available as a special Thanksgiving-only dessert option, none of us really care for that and decided to opt out from it. Instead, we got ice cream sundaes from the Gibson Girl Ice Cream Parlor as our dessert and enjoyed them while listening to the piano player at Refreshment Corner. One of Disneyland’s long-standing traditions for the holiday season is to offer special seasonal food choices at some locations and one of my absolute favorite is peppermint stick ice cream. That was a key motivation for me wanting to get ice cream for dessert and it was as good as ever. During the remainder of the afternoon, we took the opportunity to enjoy some of the park’s special offerings for the holidays. This included two rides (one during the day and one after dark) on It’s a Small World, which they have been extensively decorating for the holidays for a number of years now. That is something we look forward to every year and we were particularly excited to see this time, since the attraction had been down for a major refurbishment since the beginning of the year. We only noticed a few minor changes (most notable being all new boats), but everything looked to be in excellent condition. This is a very popular attraction during the holidays, but the lines were very short (10 minutes or so) each time. Thanksgiving just isn’t a very busy day at the park. Other than the two rides on Small World and one ride on King Arthur’s Carrousel, we didn’t actually do any other rides that day. Instead, we spent some time looking at the various decorations as well as paying a visit to the "Reindeer Roundup" area on Big Thunder Trail to see the pardoned national turkeys (who usually end up at Disneyland after the ceremony with the president) and pay a visit to Santa Goofy. We also enjoyed a walk through the newly re-opened and updated Sleeping Beauty dioramas in the castle. This had been closed for about 7 years and it was nice to see it return. After dark, while my wife went off to do some shopping, my son and I enjoyed sitting for a while at the hub waiting for and watching the lighting ceremony where they turn on the elaborate Christmas lights on the castle. We left the park for home around 7:30pm or so and found traffic to be fairly light for the drive home. We made a couple attempts to see if we could find any fast food restaurants opened for a small and quick dinner, but found that everything we checked was closed. I guess there just isn’t much demand for McDonalds or Burger King on Thanksgiving. While we were getting a bit hungry by the time we made it home (and fixed some hot dogs), I did think it was nice that those places let their employees spend the holiday evening wieh their families. This was a nice Thanksgiving and, despite some complaints about the meal, I felt we made a good choice as to how to spend the day. In part 1 of this report, I mentioned that over multi-day visit to the Disneyland Resort was a replacement for an originally planned trip to Walt Disney World around the same time and that we decided to delay the trip because our son had become skittish about visiting theme park attractions. Since the Disneyland Resort is so much closer to home and we visit it much more frequently, we figured that our visit there would be a better opportunity to keep trying to re-build his courage while not really feeling like we are missing all that much if what we can do remains pretty limited. During this visit, we let our son largely set the pace and do a lot of the choosing when it came to the rides and shows that we visited, but we also gave him a lot of encouragement to work some new experiences into the visit as well. He visited his favorite attractions (King Arthur’s and King Triton’s Carousels, Mad Tea Party, Tuck and Roll Drive ’em Buggies, Goofy’s Playhouse, Playhouse Disney Live, Enchanted Tiki Room) while also talking him into visiting several that weren’t on his previous "approved" list (such as MuppetVision 3D, the Aladdin stage show, Toy Story Midway Mania, and the Mark Twain Riverboat). We still didn’t do any of the major thrill rides, even though he is now tall enough for many, but he definitely is making progress. One thing to note is that we did almost entirely stick to visiting attractions that our whole family could do together. I really was the only one in our party that could have done most of the major thrill rides, since our son isn’t really up to them yet and everyone else in our group has restrictions due to medical conditions. I’m certain I could have gone off to do some of the coasters had I wanted to, but I really was far more interested in family time. I do look forward to the time when my son is ready to do some of those bigger rides with me, but I’m also in no rush about it. The experience of seeing the attractions with my child is so rewarding that I don’t miss the thrill rides. In the rest of this post, I’m going to write up specific notes on a few key attractions. Our visits to the Disneyland Resort have become less frequent than they used to be and these trips ended up being the first opportunity to see a few new attractions and shows. I’ll also include a few notes about some of the other attractions and shows that included some memorable element. 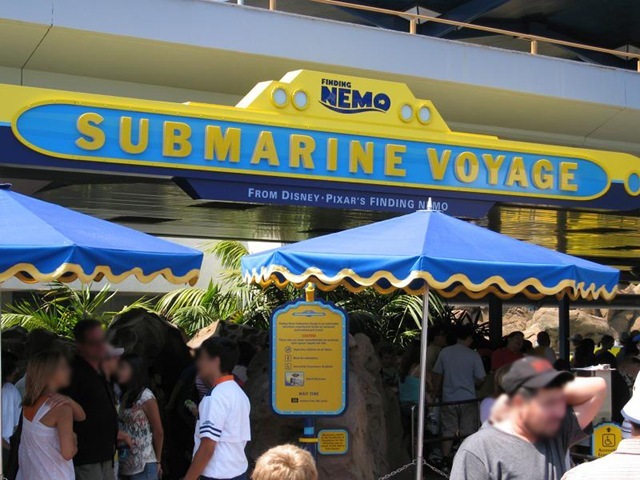 The re-themed and re-opened version of Disneyland’s classic Submarine Voyage was the major new attraction for summer of 2007. Due to the extremely long lines (often over 2 hours or more) combined with our son’s skittishness, we hadn’t yet visited it before this trip. We were pretty determined to finally see the ride on this visit, with my father (who is a major Disney-enthusiast) being particularly excited to have the opportunity to ride the subs again. During our first full day at the parks (Monday 6/23) the ride was having a lot of technical difficulties, resulting in it being closed for much of the day. I’m not really sure if it ever actually opened that day as it was listed as "temporarily closed’ every time we checked in. We did leave the resort for dinner at Knott’s that evening, though, so it may very well have opened later in the day. Seeing it closed so much on Monday did make us (my father in particular) pretty nervous about whether or not we would actually get an opportunity to ride it. On Tuesday, though, the ride was opened and we found that it had a posted wait time of around an hour shortly after we had finished our lunch at the Blue Bayou. One really nice feature of the ride is that they offer a special, alternative experience for disabled guests who are unable to board the submarines. Off to the side of the dock where guests board the regular ride, there is a building containing a small theater (it seats about 30 guests) where they show a high-definition video presentation of the full ride experience. My mother suffers from severe arthritis in her legs (she has to use a motorized scooter much of the time) and couldn’t possibly have managed the narrow ladder to get onto the ride. My wife has a back condition and also had doubts about whether or not she could board, thus she decided to join my mother and attend the alternate version. They took our son along as well, since we were pretty doubtful that he would be willing to board the rather claustrophobic submarine. Guests using the alternate experience enter through an entrance near the monorail entrance. With the fairly high-capacity and fairly low-demand for it, they found that they only had to wait for the next available showing. After helping them to get situated in the line for the alternate experience and arranging where to meet later, my father and I were prepared to head around to get into the hour-long queue for the regular ride. Much to our surprise, the ride attendants instead escorted us to a nearby waiting area and told us that we would be put onto the next submarine. That means that we boarded the regular ride about the same time that the others entered the theater, thus minimizing the amount of time our family was separated. The headline for this post is not a typo. This report is going to cover two different stays at the Disneyland Resort over just a few short weeks of time. We first spent 4 nights at the resort on June 22-25 and then stayed overnight again on July 4th. We have a membership in the Disney Vacation Club (DVC) timeshare and had originally planned to make a trip to Walt Disney World in late June right after our son completed his first year of pre-school. After our October trip last year, we found that our son had become pretty skittish on rides and attractions and we decided it probably would be wise to delay our trip until December to increase the chance that he would grow out of that a bit. Canceling that trip meant that we ended up with a number of DVC points that we had to use by August or end up forfeiting them. My parents live in the Orlando area and they decided to come up to visit us during the same period that we had originally planned our Florida trip. They were interested in staying down at the Disneyland Resort for a few days, so it then made sense to use up those points with a stay down there. After researching, we discovered that we had the points available to cover the cost of a concierge-level room at Disney’s Grand Californian hotel for those 4 nights in June with enough left over for the 4th of July as well. We had used points to stay there on July 4th for the last few years (avoiding the need to drive home after the fireworks) and it was very appealing to do that again this year while also having the chance to enjoy a longer, multi-day stay at the Grand Californian as well. Instead of trying to test my memory with a day-to-day report on our visit, I’m going to categorize my report. In this first part, I am going to concentrate on our dining experiences during the trip. I’ll likely add additional parts to this over the next few days reporting on other aspects of the trip. My parents arrived mid-afternoon on June 22 and we decided that a character dinner would be a good way to start the trip. Around the 60 day mark before our trip, we made reservations at Goofy’s Kitchen (at the Disneyland Hotel) for that first-night dinner. Our reservations were at 6pm and we were happy that they were able to seat us within about 5-10 minutes of our arrival at the restaurant. Walk-up guests were being told that there was a 90 minute wait, so reservations are definitely a very good idea here. Before seating, they gathered our family together for a photo with Pluto. About halfway through the meal someone came to our table to try and sell us a pretty overpriced (around $40, if I recall) package of the photos. They did the same thing when we did the character breakfast at PCH Grill later in the week (this time with Daisy Duck), so this must now be standard at the character meals. In both cases, we declined as the packages were pretty costly and the photos weren’t that great. I don’t remember encountering this there before (although it has been a while since we last did a character meal at DLR) and I don’t really care for this system. I don’t mind the pre-meal photos, but I’d much rather they use Photopass to sell the photos. At least at PCH, a CM did offer to also take a couple photos with our own camera, something that wasn’t offered at Goofy’s Kitchen. The food at Goofy’s was ok, but nothing special. This was consistent with our past experiences there. We have always found that you definitely go there much more for the character-experience than for the food. The food is definitely better than a low-end buffet like a Hometown Buffet, but I would also say it is closer to that than it to what you typically find at a high-end hotel buffet such as at the better Vegas hotels or at somewhere like a Hilton or a Hyatt. Those used to the Walt Disney World character meals are also apt to be disappointed by Goofy’s based on our typical experiences. The buffet does feature carved prime rib as a main entree and it was pretty decent. On my first trip up there, I did get a piece that turned out to be quite a bit more rare than I generally like (and I prefer beef to be medium to medium-rare), but I can’t fault them too much for that since I didn’t specify a preference. On a subsequent trip up there, I was easily able to get another slice that was more to my taste. I do think they should probably ask before serving the meat that rare, but it still wasn’t that big a deal. I did think the rest of the selection at the buffet was somewhat more limited than it should have been, which was not unexpected based on past visits. For example, I was really surprised that they only offered one variety of roasted potatoes (which I couldn’t eat because they had onions) and didn’t even have the mashed potatoes and gravy that are usually commonplace at this kind of buffet. I actually thought that the children’s section of the buffet was a better selection. They had a couple different kinds of pizza, chicken strips, popcorn shrimp (I actually had quite a bit of this), macaroni and cheese, and spaghetti. Our son actually completed finished off two pretty full plates of food, which was a larger meal than we are used to him finishing. He especially liked the spaghetti and ate two pretty big helpings of that. My family spent the afternoon at the Disneyland Resort on Sunday, April 14. The primary purpose for this trip was to meet up with a couple friends to experience the special food offerings available at Disney’s California Adventure for the Taste of California Marketplace, which is part of the annual California Food and Wine Festival currently being offered in the park. This is the west coast version of a popular, long-running event that Disney holds every Fall in Epcot at Walt Disney World. The Taste of California Marketplace offers a selection of fairly small, sampler-style portions of a number of different food items, all designed by California-based chefs and intended to represent the state’s culinary culture. Small cups of California-made wines and beers are also offered to accompany these. All of these items are available at the now-defunct Lucky Fortune Cookery counter-service restaurant, which is located in the Pacific Wharf section of the park. This location provides a good infrastructure for the food service as well a large dining area (shared with two permanent restaurants with a great deal of available tables and chairs. It makes for a much more convenient location than the multiple locations that were used during the first year of the event and which are still in use at the Epcot event. The sampler-sized portions served at the Marketplace mean that the typical guest is likely to try a variety of choices, particularly if the items are being ordered as a meal rather than as a quick snack. I ended up ordering 5 of the different food selections as well as one cup of wine. Another couple that was dining with us eventually ordered and shared at least one of every item offered. I initially ordered one each of the chicken and beef California skewers, the Festival Cheese Plate and a cup of Mirassou Chardonnay on a first trip to the counter. The Marketplace also has the usual selection of soft drinks available and, since it was a hot day and the wine doesn’t really work as a thirst-quencher, I did order a Coke as well. After finishing those, I was still hungry enough to try a couple more items, so I went back up and ordered the Pepper Crusted Beef Tenderloin Slider sandwich and, for dessert, the Seasonal Berry Trifle. I particularly liked the skewers, which included the meat and a few various vegetables with a sweet chipotle glaze. The sauce was fairly strong, but I found it to be extremely tasty and to really complement the flavor of the meat. I generally don’t like cooked vegetables, and I have a strong sensitivity to onions, so I didn’t really eat too much other than the meat. That did make the portions especially small for these (a common problem for me with skewers), but I did really enjoy the portions I did eat. The cheese plate was ok, although I tend to like somewhat softer textured cheeses than most of the ones chosen for this platter. For one thing, I tend to find softer cheeses to be a bit more flavorful while these were a waxy. The one big exception was what they described as a huntsman cheddar bleu, which I thought was absolutely delicious. I love bleu cheese and it mixed with the cheddar to form a flavor that I found tremendously appealing. The cheese plate also came with some seedless purple grapes which were very fresh and at just the right level of ripeness. The platter also featured a good sized pita crisp. I’m not really much of a wine expert, so I asked the clerk to recommend a wine that would go well with my order. She suggested the Chardonnay as a good compliment for the cheese plate and I found that it did go well with it. My least favorite of the items that I tried was the Pepper Crusted Beef Tenderloin Slider. This miniature sandwich was served on a small brioche roll and also included onion crisps and what Disney described as a citrus mojo criollo sauce. Due to my sensitivity to onions, I had to remove most of them from my sandwich, although I was able to leave a few on as I’ve found that fried onions generally don’t affect me quite as much as ones that are raw or cooked in other ways. That meant that I was able to get at least a bit of the flavor that they added to the sandwich. The sauce was very heavy on garlic, though, and I strongly expect that one’s taste for this sandwich will be very much measured by one’s tolerance for garlic. I generally do like garlic and initially found that I really liked the flavor. About half-way through the sandwich, though, I found that I had pretty much had my fill of it. The friends we were with pretty much picked this as their favorite item, though, so certainly your mileage my vary. For dessert, I had actually asked for the Ghirardelli Chocolate Marquise, but was surprised when they gave me the trifle instead. When I checked the receipt, I found that it did show the trifle as well, so I guess that the cashier must have hit the wrong button. Since the trifle was generally to my taste as well, I decided not to bother trying to get it corrected. The berries were strawberries and were very fresh and nicely sweetened by both the vanilla custard and light whipped cream. The pound cake was a tad more dry, but still tasted very good. Overall, it was a good dessert, although I would probably be interested in still trying the other one if I make it back there before the end of the festival. One thing that should be noted is that the marketplace does not make for an inexpensive meal. The items are priced fairly high for the portion sizes and getting enough food for a filling lunch can quickly run up in costs. They do honor the customary discounts for annual passholders and Disney cast members (employees), which can lower the cost a tad if you qualify. Without discounts or tax, the food items that I ordered came to a total of $24.50. The glass of wine was another $3 and the Coke was the usual $2.50 or so (I don’t recall the exact amount). Those prices for just one person are in the same ballpark as lunch at a fairly high-end table-service restaurant, although with service and presentation that are more in line with fast food. I mentioned at the beginning of this post that I visited with my family, but I haven’t mentioned anything about my wife and son’s food choices. The reason for that is that neither of them ended up ordering from the Marketplace. The food choices just didn’t really appeal to my wife’s tastes and we also decided that the combination of the high prices and fairly exotic selections were questionable for a 4-year-old, even though our son does tend to be a fairly adventurous eater. This was where the Food and Wine Festival’s setting inside of a Disney theme park was very much an advantage. It was only a very short distance for them to go over to the Farmer’s Market counter service restaurant where both were able to get chicken strips for lunch. The close proximity between the somewhat upscale offerings of the festival and the more traditional theme park offerings served us well after lunch as well. Our son did get restless with the somewhat longer, more formal lunch (and he was in a bit of a cranky mood anyway), but afterward we were able to easily take him to do things that were more enjoyable to him. Had we not been visiting with a small child, we might have been more interested in exploring more of the seminars and other events associated with the festival. Instead, we park-hopped over to Disneyland where he got to visit with Mickey and Pluto, ride the tea cups and the carrousel, and then finally see the "Enchanted Tiki Room" show before we headed home for the day. It was an extremely hot day, so we were fortunate that lines were pretty short allowing us to do quite a few things in just a couple hours. California Adventure had been pretty crowded that day, so we were expecting much larger crowds at Disneyland than we actually found when we got there. I suspect the Food and Wine Festival is turning out to be a pretty good attractor for the park, although I’m also sure that the "2 for 1" deal for that gives 1-day at each park for one price is also bringing a lot of people in. I would guess that most weekend visitors taking advantage of the deal likely go to Disneyland on Saturday and California Adventure on Sunday, which would account for at least some of what we saw. I did notice that the lines for the regular restaurants in the Pacific Wharf area of the park were substantially longer than the lines at the Marketplace, which probably isn’t too surprising at the prices they were charging. I would overall consider our experience with the Food and Wine Festival to be a positive one. The food choices at the Marketplace made for a very enjoyable and interesting lunch, even if the prices were definitely somewhat inflated for what was being offered. Still, it was an overall positive once-a-year experience and I could easily see going again next year. This evening, we visited Disneyland to see the annual Candlelight Processional and Ceremony, a long running program of traditional choral Christmas music performed in the Town Square area of Main Street USA. This show features a combined choir made up of numerous area choirs along with a live orchestra and a celebrity narrator. This year’s narrator was Jane Seymour. Although the show is held on Main Street during park hours, it isn’t heavily promoted to the public and a large portion of the viewing area is reserved seating that is not particularly easy to get. They do offer a very limited number of expensive dinner packages to the general public, but the vast majority of the tickets are distributed to invited guests, mainly through various Disney corporate partners. Most of the public viewing is largely obstructed views and a generally long wait is required to stake out a half-way decent spot. Since we have a 4-year-old that wasn’t likely to sit patiently for the 60-minute show (not to mention the fairly long wait), my wife and I decided to each go to a separate performance while the other took our son on attractions. Right after the second parade got past Main Street, my wife headed off to find a spot for the 5:30 performance. She ended up staking out a spot opposite the Opera House, pretty much right by the rope into the reserved seating area. As soon as the processional started to make its way into the theater, she joined the crowds in that area that were allowed to move in to fill the unused seats in the reserved seating area. As a result, she ended up with a really good seat for the show.